In my post a couple of weeks ago on the selection of NASA’s next low cost planetary mission, I said that the conditions NASA imposed on scientists proposing missions would determine much of what kind of missions scientists could impose. Yesterday, NASA released a preview for the next competition. There are some important innovations and a major limitation. NASA announced that the budget for the spacecraft, instruments, and data analysis (the Principal Investigator (PI) budget) would be $450M (FY15 dollars). This is a small increase from the last competition’s PI budget of $425M, and by itself would not keep up with inflation. The major limitation for this competition is that NASA will not provide a radioisotope power system for this competition. While recent NASA presentations suggests it has sufficient plutonium-238 fuel to support a Discovery mission, that fuel could not be prepared in time to meet the expect launch date for this competition. As a result, any mission that cannot use solar power is effectively eliminated. This would include missions beyond Jupiter, to the permanently shadowed lunar polar craters, or where large solar panels just won’t work like for a mission that would make multiple landings on a comet (see this description of the CHOPPER mission proposed for the last competition). NASA traditionally offers scientists various technologies at the space agency’s cost that it would like to see tested in space. For this competition, NASA says it is considering providing a version of the NASA Evolutionary Xenon Thruster (NEXT) ion propulsion engine as well as heat shield technology for missions that would send a probe into planetary atmosphere. These former would benefit missions that would require large amounts of thrust such as main belt asteroid missions or comet rendezvous missions. The latter would benefit missions such as Venus atmospheric probes. NASA also is considering requiring proposals to include carrying its Deep Space Laser Communications (DSLO) package. This technology was tested on the LADEE mission currently orbiting the moon and showed that lasers could return much larger volumes of data than traditional radio systems. NASA would now like to try this technology from a spacecraft in deep space. Missions with low data rates such as Venus atmospheric probes probably would see little benefit from the DSLO system. Missions with lots of imaging data such as Venus radar mappers or Io multi-flyby missions would make good use of the DSLO system. One other new requirement is a limitation on how much of the cost of instruments foreign space agencies can contribute. NASA has had a limitation that foreign governments could not contribute more than one-third the cost of the total mission. That cap now also applies to the contribution to the cost of the science payload, too. This appears to be a way of preventing a proposal team from minimizing its PI costs by filling most of the payload with instruments paid for by other governments. NASA apparently wants US planetary missions to provide opportunities for US scientists to fly their instruments. All in all, this looks to be a nice opportunity that keeps the Discovery program on track to continue to support innovative missions to a variety of destinations in the solar system. By studying asteroids (and their cousins, the comets), scientists can study the remains of conditions from the earliest solar system. Some of the protoplanets have a familiar structure like Vesta with its rocky mantle and metallic core that resembles the structure of the terrestrial planets. Others are unlike any world we have explored to date. Massive Ceres is a rock-ice world with a deep mantle of ice and is a member of a family of asteroids that emit water vapor (some are even comet like with full dust and ice vapor trails). 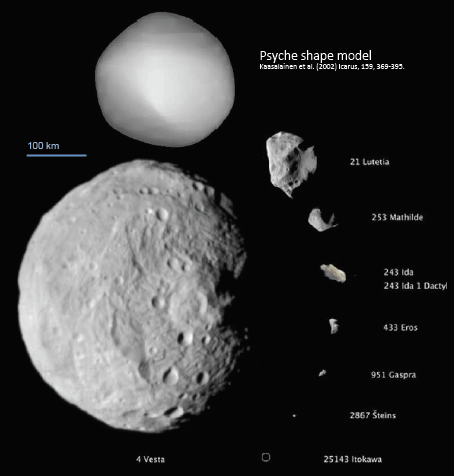 The asteroid Psyche is a metal world that may be the remnant core of protoplanet. In the competition for the next Discovery mission expected to begin this year, we can expect a similar enthusiasm from the scientific community. A good portion of the proposals will probably be to fly to one or more of the small asteroids whose orbits are near the Earth’s. Flights to these worlds are relatively easy, making the missions that orbit them and even land budget bargains and low risk. In addition, collisions, gravitational influences of the true planets (especially Jupiter), and even the pressure of the sun’s light have scattered the smaller asteroids across the solar system. Within easy reach from Earth are bodies representing a plethora of conditions that were found across the early solar system. Even with the stiff competition, though, some scientists try to build support for their proposals by making some disclosures in public. It can’t hurt to have the members of the review panels already excited by a mission before they evaluate the proposal. 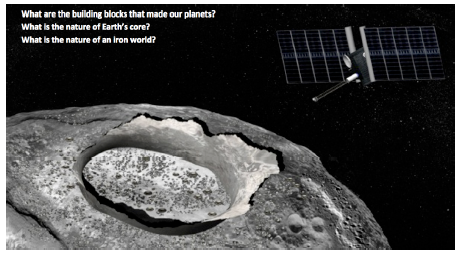 In general, we hear more about how scientifically interesting a destination is (those facts are widely known) and less about the spacecraft and instruments (what I know many of the readers of this blog are most interested in). The few times we hear about detailed implementation, it generally is to a destination that seems beyond the reach of a Discovery-class mission where building technical credibility before the review likely helps. All three of the teams that have proposed missions to the Saturn system, for example, have revealed a fair amount about the implementation. The Discovery program is unique in NASA’s planetary program. Within the budget constraints of each selection, the scientific community is free to propose any mission to any destination. In the last selection, the finalists were the Insight Mars geophysical station (which was selected), a mission to land on the lakes of Titan (TiME), and a mission to orbit and repeatedly land on the nucleus of a comet (CHOPPER). 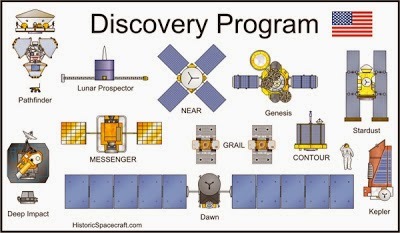 To paraphrase Forest Gump, the Discovery program is like a box of chocolates – you never know what you’re going to get. The creativity of the scientific community has given us a wide assortment of missions in the past and is likely to surprise and delight us again. The missions of the Discovery program have visited a wide-range of solar system destinations. Image from Historic Spacecraft and used under a creative commons license. A month so or so ago, it appeared that the selection of NASA’s next mission in this, its lowest cost planetary mission program, was on indefinite hold. This program in its first decade produced an incredible wealth of missions of ten missions that studied Mercury, the moon, Mars, asteroids, comets, and the sun. The program more than fulfilled its goal of ensuring that NASA’s planetary mission portfolio was diversified. Realistically, there will be limits to the missions that can be proposed for the next Discovery mission. NASA’s managers will have to decide on the budget they can afford for the mission. In the past, scientists could propose missions with a total cost of ~$425M for the spacecraft, its operation, and the data analysis. (NASA paid for the cost of the launch and some other expenses separately.) Jim Green, head of NASA’s planetary program, said in a meeting recently that the budget will decide how ambitious missions could be. To afford a mission to the outer solar system, the budget would need to be closer to $500M, but a smaller budget could be set for missions to the moon, Venus, or Mars. We will get answers to most of these questions (except the tolerance for risk) in a few months when NASA releases the draft Announcement of Opportunity (AO) for the next selection. AO’s spell out what NASA is looking for, the budget it has set, the class of launch vehicles it will pay for, and what resources it will make available such as a plutonium power supply. Proposers will decide to propose or not in response to the constraints placed on the selection. The Mars Scout program selected missions similar is scope to the Discovery program and has since been merged with the Discovery program. I’ve indicated these missions with an asterisk.